American Eugene Phelps (198-F-90) had a very impressive game in the last round for Samsung Th. 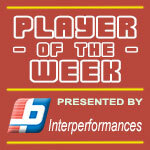 and that's him to receive a Interperformances Player of the Week award for round 25. The 28-year old forward had a double-double of 25 points and fifteen rebounds, while his team edged out Mobis Phoebus (#1, 26-8) 88-86. Samsung Th. 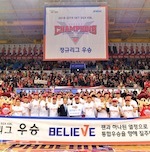 maintains the 10th position in South Korean KBL. The season is in a full swing, so it's only a dream for the team to make it into top half of the standings. For contrary they may face relegation if the situation turns from bad to worse. Samsung Th. have already lost 25 games and recorded just nine victories. Phelps turned to be Samsung Th. 's top player in his first season with the team. Long Beach State University graduate has very impressive stats this year. Phelps is league's best scorer averaging so far 26.1ppg. Phelps is in league's top in rebounds (3rd best: 13.7rpg) and averages solid 1.4bpg and 50.8% FGP. The second most remarkable performance in last round's games was 33-year old American power forward Brandon Brown (201-PF-85) of KCC Egis. Brown impressed basketball fans with 38 points, 8 rebounds and 5 assists. Bad luck as KCC Egis was edged by the higher-ranked KT Sonicboom (#3, 20-13) 106-103. This loss caused KCC Egis to drop to 7th position in the standings. His team is not often considered as one of the league's best with a mere 16-18 record. Brown is a newcomer at KCC Egis and it seems he did not have too much trouble to become one of team's leaders. He belongs to the best scorers in the league with 24.8ppg (#4). His other stats are also decent: 12.6rpg and 3.2apg. Cal State - San Bernardino alumni Brown played also at Eurobasket Summer League, which is considered top summer league for players who want to play basketball overseas. 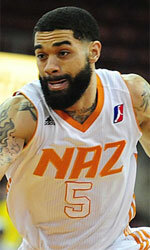 The third best performed player last round was American forward Ricardo Ratliffe (203-F-89) of top-ranked Mobis Phoebus. Ratliffe showcased his all-around game by recording 24 points, fifteen rebounds (!!!) and five assists in the last round. Despite Ratliffe's great performance Mobis Phoebus lost 86-88 to the lower-ranked Samsung Th. (#10, 9-25). But his team cannot count on just a single player as he also needs help of the other teammates. The last thing Mobis Phoebus needs is to lose another game like this one. They lose more and more distance to the top teams. Their record is 26 victories and 8 lost games. Ratliffe has a great season in South Korea. After 32 games, he made it on the list of the league's leaders in points with 23.5ppg (5th best) and rebounds with 14.8rpg (#1 in league). He also has 1.8bpg and FGP: 62.3%. Ricardo Ratliffe has also South Korean passport and can play in the league with a status of domestic player.